Who even knew they still sold alphabet pasta? 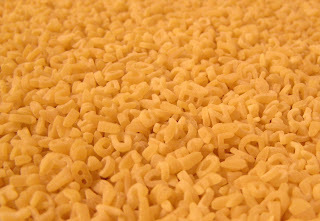 Does anybody actually prepare and eat alphabet pasta? I thought of a better use for it. 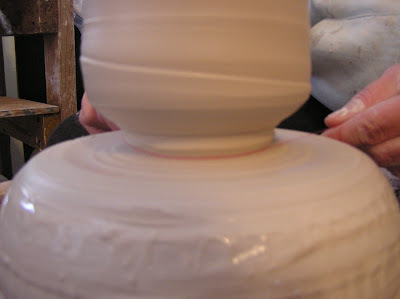 This pot came off the wheel only about a half hour before the photo was taken. 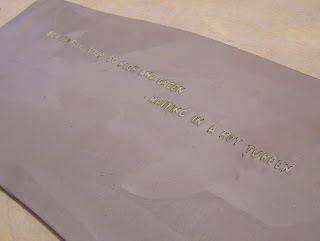 Afterwards I lightly paddled to impress the letters more deeply into the clay. 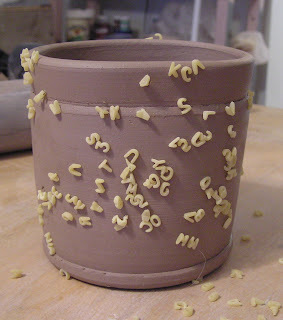 The user will have to actually look at the cup to notice that the texture is made up of tiny little letters; and I can imagine that some of the lettters fell in such a way as to form or almost form words. You could spend a good deal of time just turning such a mug in your hands, searching for those secret words. Okay, back to the real work! 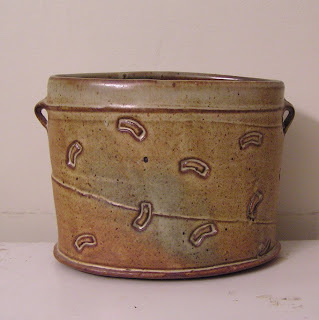 I was a grad student at the time, but I was fascinated by this demo, and later purchased the pot to commemorate the insight it gave me: that the tension between the mechanical qualities the wheel imparts and the squooshy organic qualities of clay itself are what inspire me. I had always done a lot of stretching and alteration. 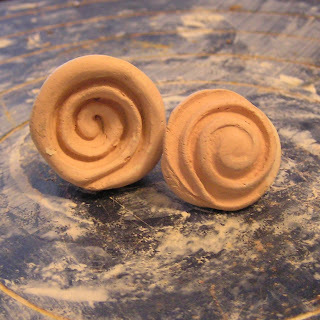 After seeing this demo, I made myself some stamps out of clay. I still often use stamps. I have approximately one billion of them, if you count the rollers. Outside of rollers, they fall into three categories: flatties, innies, and outies. It being winter, it's glaze testing time at Fine Mess Pottery. 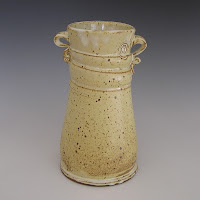 Actually it is always glaze testing time at Fine Mess Pottery, but the in months when production demands are less, I have more time for testing. I don't know about you but I hate test tiles. 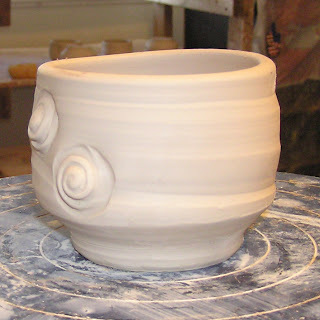 I only need about a half-dozen tests at a time, so I'd much rather use small, quickly-thrown tea bowls (or wine cups, as they are known at my house), which at least have the potential to become beautiful objects. 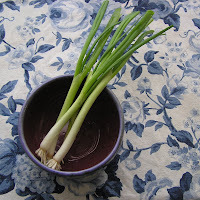 They also have to potential to become hideous or just blah, which is why they are called "tests," so I don't want to invest a bunch of time in them; specifically I don't want to have trim them. I found a trick to make that easier. 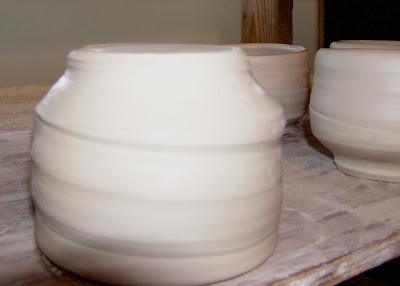 The pots always needed trimming, if they were to sit flat. To streamline the process in the case of test pieces, I now cut them off with a piece of thread. 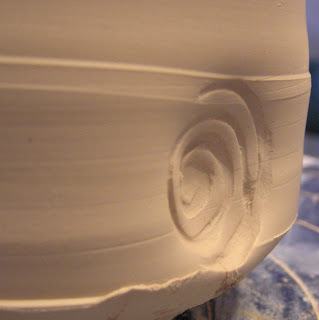 Once forming is done, I use the point of a rib to create a little notch at the very bottom of the pot. I place a piece of thread (a bright color is easier to see) in that groove, wrap it around, and then cross the ends on the near side and pull in opposite directions. 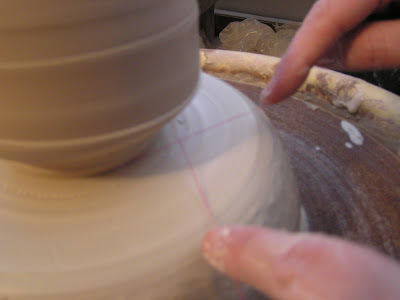 The result is an even bottom which only needs a quick swipe with a rib to finish it nicely. 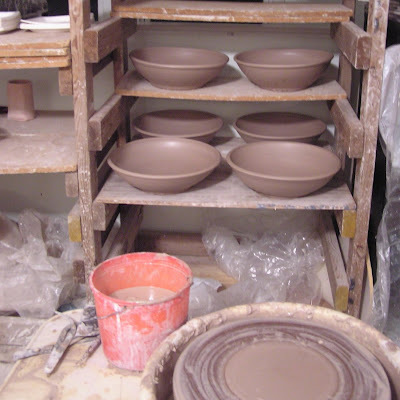 There is nothing like a deadline to push me out of navel-gazing mode and into production; and everything on my production list today is bowls, bowls, bowls! The clock is ticking on a four-week deadline to complete my order for Attrezzi, and I promised Watershed 20 bowls for their Chowder Supper fundraiser. 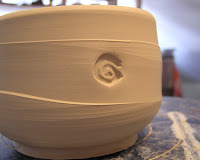 The Watershed Center holds an annual fundraiser serving various Maine chowders in handmade bowls. Buy the chowder, keep the bowl! They need hundreds, but I'm responsible only a few. The recession has hit Watershed hard, and they have had to discontinue the 9-month winter residency. On the upside, they have added an extra two-week summer session, and a six-week event to happen in the fall. Watershed has been a very important to me, so I'm happy to do my part in supporting it. 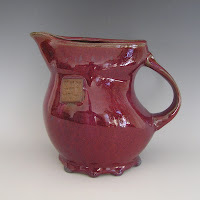 I don't often have money to donate, but pottery? I can do that. I am a sucker for a pretty package; isn't everyone? At least, that is what I am counting on. In an effort to win some wholesale orders for salt & pepper shakers, I am sending out a prettily wrapped sample shaker to a handful of past and potential wholesale accounts, with a little folding card extolling the fine qualities of stoneware shakers. If it nets me a single order, it will be worth it; and I had all the fun of choosing boxes, tissue, and rafia colors. I am starting to think marketing could be fun. My first job, not counting babysitting, was at a Dunkin' Donuts. I worked my way up the ladder from waitress to finisher, which mean I got to fill, frost, and decorate the donuts. I always had a mental bet with myself that I could make customers pick, say, blueberry filled donuts, on any given Sunday, just by the way I presented them. I am recalling that lesson now: presentation is almost as important as product, when it comes to selling. Which is good news for an artist. It means you don't have to cater to the tastes (or your best guess of them) of the market. You just make what you are driven to make, and if it is presented correctly, people will buy it. Or that's the theory. They bought those disgusting blueberry donuts, anyway. Car trouble made me miss the first class of the new session tonight. The owner of the teaching studio was none too pleased about it, but what could I do? My superpower is cat herding, not flight. I was already moody with winter, and this tipped me right into downright pissy. 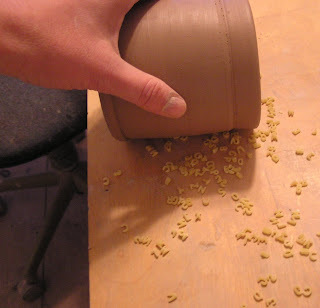 But I know the cure for that: pasta bowls! 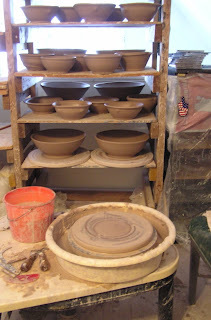 These are each six pounds of clay, and will eventually be part of a larger order for a gourmet kitchen goods store in Portsmouth. Big (well, biggish) bowls are good for dispellling the crankies because they demand enough physical effort to use up the adrenaline that's just hanging around turning sour, but they are simple to throw and provide me with a few easy successes. The worst things to make to throw off a bad mood are fiddly little stuff with a bunch of parts, like soy bottles or teapots. Anyway, they worked. I feeel much better. Cars, meh. They break, that's life. My beginning students will manage without me this one night. Organizing receipts for the Tax Man. Studio clean up: dreary but has to be done. More studio time! 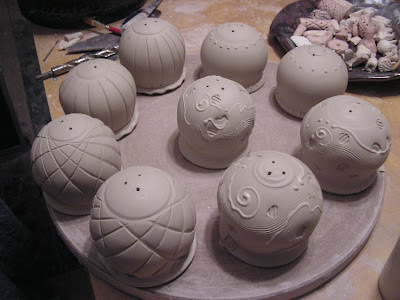 More shakers, and is that a teapot itch I feel? Hobbies: Jumping off things, & wondering why my car is suddenly really loud. Favorite activities: Watching the wind push daisies around. Banging nails. Not interested in: Buying a bunch of stuff. Debt makes you old fast. See what I mean? He stood out like a live man in a row of corpses. He wasn't too worried about scaring someone off to let his personality show. I answered him, and the rest is history. I decided to try and apply that lesson to online retailing. In the listings for which I don't have five photos to fill all the slots, I am putting in photos of something unrelated: a sheep from Straw's farm near Watershed, my cats looking out the window, a rusty gear. And a note saying, the sheep hasn't got anything to do with it, I just like the photo. Or something like that. I thought it was brilliant, so I posted it in the Etsy forums. Guess what? Everybody very very kindly said it was a stupid idea. Which only proves my point. Well, no it doesn't. But there's this: I can't sell any less from my Etsy shop than I already am. Might as well try something different! 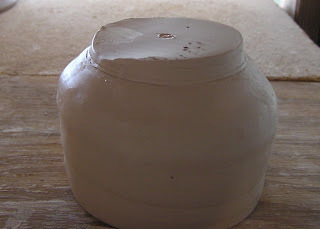 In winter the conditions for photographing pots are brief and fleeting at my house. Except for the smallest pots, I shoot in the south-facing living room during the perhaps three hours (at most) of daylight that the sun not at too acute an angle to cast even light. I hang the backdrop where my TV usually sits. It's kind of a hassle to get all set up, so when I do it, I try to shoot a lot of work. 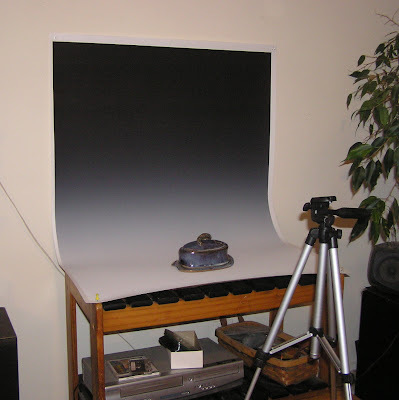 The graduated gray background I got for around $45 from Photo Tech, Inc. The camera is relatively old, an Olympus c-750, 4.0 megapixels. Five or six megapixels is standard in cameras made now, but I find that this serves just fine for my purposes. Importantly, it has a remote setting, so you don't have to touch the camera to activate the shutter. 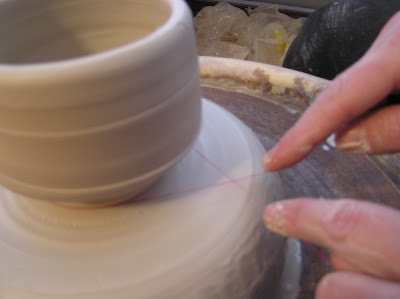 Until I learned how to use it, every single pottery photo I took was ever-so-slightly out of focus. You can get them on Ebay for a couple hundred dollars. After destroying two of the cheapest available tripods in a few months just through ordinary use, I finally, just today, went the next step up: $3 more. (I told you I am cheap, didn't I?) This one is so much better! The legs adjust infinitely and it has a teeny-tiny bubble level under the camera, so you can make sure you are shooting, well, level. ...continues into the new year. Happy 2010, everyone! Also, I started a new page for wholesale customers. Not much there yet, but it's a start. I feel like crap. Not literally crapulent, as I didn't drink much last night, being the designated driver, but I like typing the word. I just feel the kind of head-achy and run down I always feel when I don't get enough sleep. I am blessed and cursed with an internal chronometer which does not allow me to sleep past 5:30, regardless of my bedtime. So my first resolution for the New Year is, get some damn sleep. 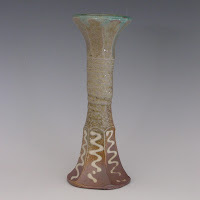 1) I have a connection to a Portland gallery that may be willing to mount a show of my sculptural work. Deadline for that prooposal is January 18, so I need toget cracking putting images together. 2) I do seem to have a minor obsession with salt & pepper shakers lately. My history suggests that I may not remain obsesssed, but will probably always enjoy making them, so I am going to develop a wholesale line, just of S&P shakers, right now. 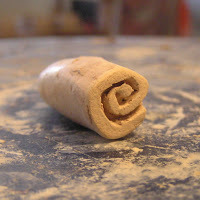 They are small, and very easy and relaxing to make, and I get such joy out of the precious little finished products. Also, not many artists are making them; fewer still handmade from start to finish. 3) The kiln! 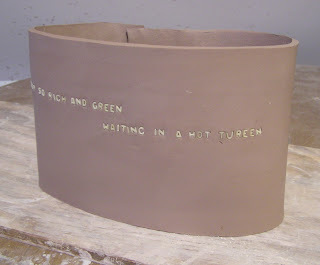 I haven't forgotten the kiln, though there will be no building on it until spring. I don't know if it will get done this year, either -- my house needs a roof. But I will continue to peck away at it, buying a hundred bricks here and a hundred there, unitl I have the materials amassed. 4) Finally, hard head wins the day over magic beans; the IPTOG stays. I am making this a concious choice, as it still has a part to play in stabilizing our household income. I could feel myself drifting away from it, almost sabotaging myself at work, in perhaps an unconcious attempt to take the matter out of my own hands; but quitting (or getting myself fired!) would be foolish at this point. Really, it isn't that bad; it's just that I can think of so many more interesting things I could do with that 20 hours per week. I'd love to hear your goals and resolutions!